This looks to only exist when using the sizes attribute, like in Twenty Seventeen. In the example above, the sizes and style="width: values are both 100vw. When I tried blocking the sizes via the plugin's sanitizer, this issue didn't exist. Though I'm not suggesting that as a solution. Still, maybe the inline styling of width: 100vw; is expected. Bringing @kienstra and my conversation here. 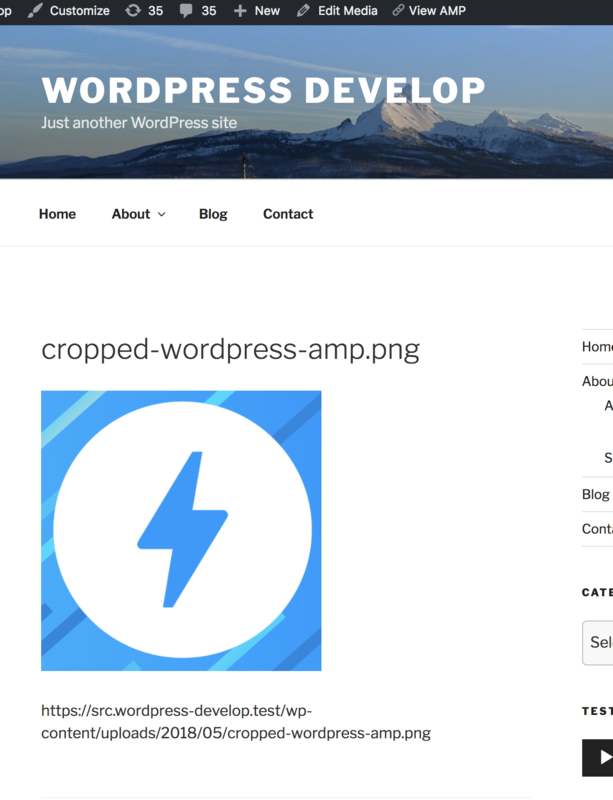 The inline width styling is applied by AMP (not our plugin) from the sizes attribute. 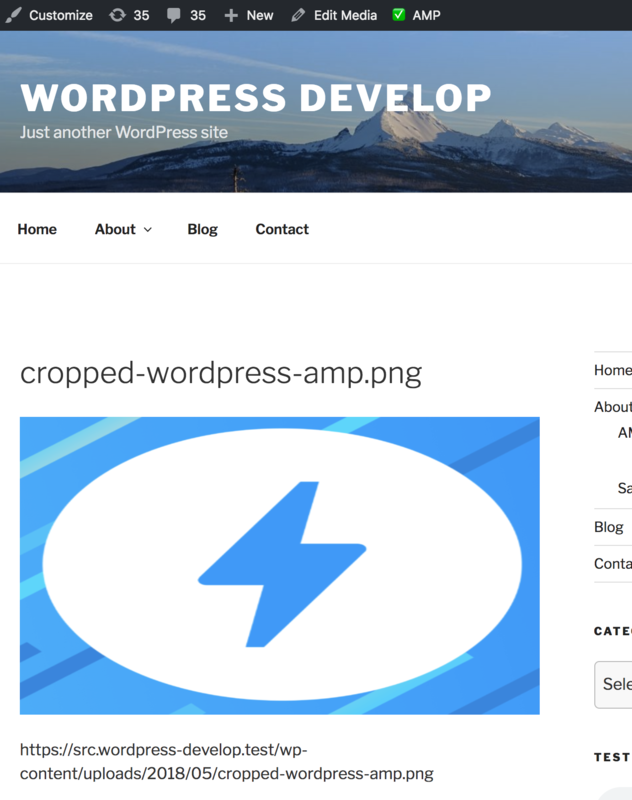 WordPress provides both the srcset and sizes while exposing a filter 'wp_calculate_image_sizes' for theme/plugin developers to customize the sizes. You can also use the sizes attribute along with srcset. The sizes attribute describes how to calculate the element size based on any media expression. Based on the element’s calculated size, the user agent selects the most relative source supplied by the srcset attribute. The sizes attribute defines the element’s width to be 50% the size of the viewport when the viewport is 650px or more. For example, if the viewport is 800px, the element’s width is set to 400px. The browser then selects the srcset resource relative to 400px, assuming the device pixel ratio is 1, which in this instance is hummingbird-narrow.jpg (320px). When sizes attribute is specified along with width and height, layout defaults to responsive. The width of the image then is set by the value in the sizes attribute as @kienstra notes above. AMP uses it to add the inline width style. @kienstra notes some possible solutions above. Option A: Remove the inline width style. Removing the inline width style also requires us to set the display to inline-block. While this can work, we'll get into timing issues between when AMP applies the inline style and then we remove it. It could cause flashes on the screen. Option B: Target the width of the parent container. AMP's Tips & Tricks section suggests setting the parent container's max-width. Attachments use p.attachment. We could target that and set a max-width equal to the size of the image, i.e. grab the width attribute of the image and use it. This possible solution would ensure the image does not stretch. That being the case, the solution chosen could perhaps be made part of the AMP_Core_Theme_Sanitizer as a specific fix for Twenty Seventeen. So a similar approach may be needed here. In fact, the existing add_twentyseventeen_masthead_styles method there could be renamed add_twentyseventeen_styles and this attachment-specific style rule could be put there potentially. Thanks, good point that this is coming from the wp_get_attachment_image_attributes filter. Could we wait a little on this issue, to see what happens with amphtml/17053? 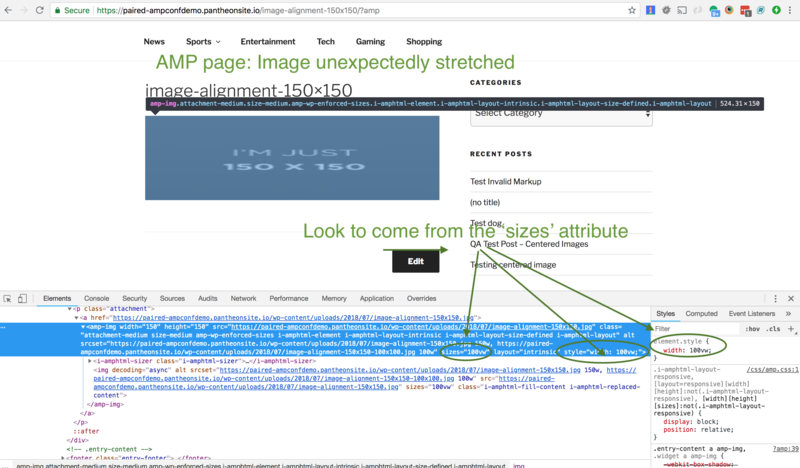 There's discussion there about possibly changing the <amp-img> behavior for sizes. Excellent. I'm glad you raised that. This commit filters 'wp_get_attachment_image_attributes' to change the layout to responsive and sizes to the image sizes per `wp_get_attachment_image_sizes()`. AMP uses these attributes to render the <amp-img>. Per issue #1237, the Twenty Seventeen theme is adding `$attr['sizes']  = '100vw';` which stretches images on the attachment page when in AMP mode. Set the layout attribute to responsive. Set the sizes attribute to the returned sizes from wp_get_attachment_image_sizes(). IMO these attribute fixes are not a bandaid but rather a fix for how the theme is setting the sizes for attachment pages. For reference, PR #1321 fixes this specific issue. However, since we have an open issue with the AMPHTML project, let's keep this issue open until that one is resolved. Once resolved, we can come back and validate this issue to ensure there are no regression problems. It looks like the Issue for the AMP project probably won't be fixed by this plugin's stable 1.0 release. So I'm moving this to 'Ready For Merging' if that's alright, as this already has a merged PR that fixes the issue. As this is only tracking ampproject/amphtml#17053, I'm moving this out of the v1.0 milestone. There's no action needed, other than remove this issue's workaround if that issue is ever resolved. This is being revisited in #2036. Please test.